Every child wants his own special bed. Free children's bed plans make a weekend project that will be appreciated and remembered for years. After selecting a style to blend with the room's decor, choose woods that will be strong and hardwearing. 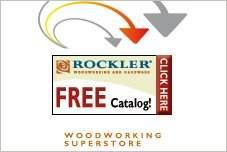 Choose a finish that will withstand years of wear and tear with little maintenance. Modern finishes provide a safe, durable surface that is easy-to-clean. 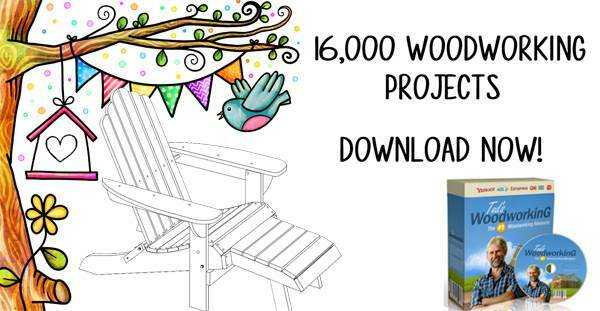 Free children's bed plans are available in a wide variety of styles and designs. 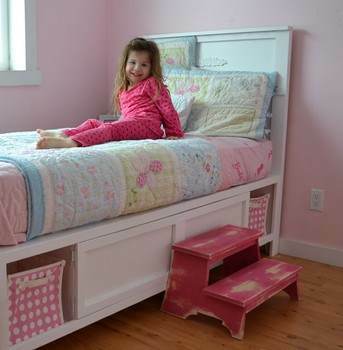 From a princess poster bed to a rough and tumble trundle bed, there are designs for every skill level and budget. Many designs can be adapted to fit different mattress and room sizes. Stencil the child's name on the headboard for extra hugs and smiles. Get the kids involved with the project and they will begin learning a skill and value their new bed even more. These are the kid's beds that don't belong in any other category. For kids, also check out the bunk bed plans, loft bed plans and crib plans. Need to build a bed in one day? 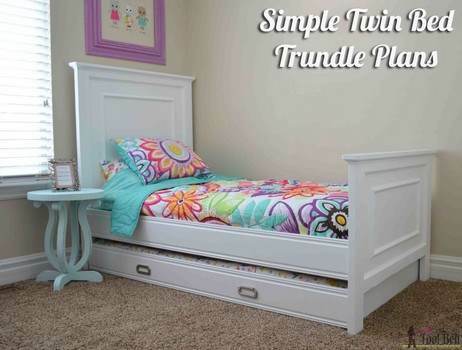 Build this strong and sturdy twin bed using this plan with step by step instructions.This bed was built with minimal power tools - just a belt sander, a small power planer, hand drill and table saw. For under $50 for materials, you can have a bed in a day! 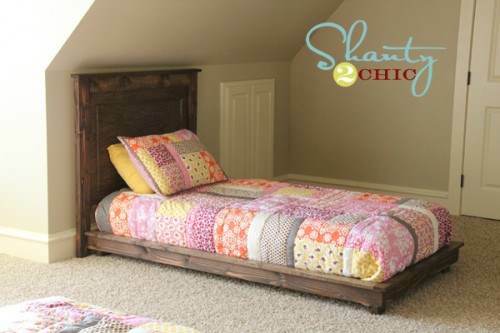 This twin bed offers storage underneath and you can leave it rustic or paint it in any desired color. Lots of places for a child to stuff their toys in the bins under the bed. See other beds built with this plan on Ana White's site. Open floor space by building this attractive trundle bed that offers an additional sleeping area when friends and relatives come to visit. You can also just build the trundle part for an existing bed; just adjust the length and width to fit your bed. This easy to build toddler bed will make a great addition to your little one's room. 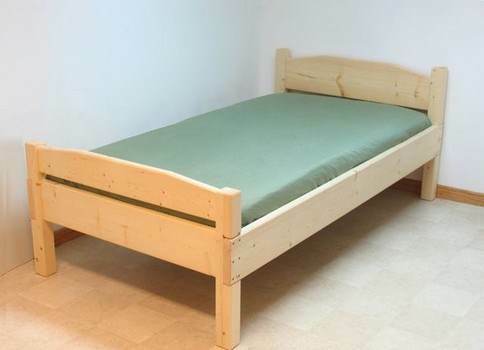 This is also an inexpensive bed to build. It is designed to fit a toddler-sized mattress. Over 20 photos of beds others have made from this plan on the Ana White site. Follow the instructions in this plan and you can have this good-looking twin bed with a tall headboard in a single day. It is a 2-part plan with plans for the bed and then the headboard. Great instructions with detailed photos. This bed has tons of storage both under the bed and around the head of the bed. Made to fit a twin mattress with 6 cubby holes under the bed for toys. Over 15 photos of how others built their beds using these plans. 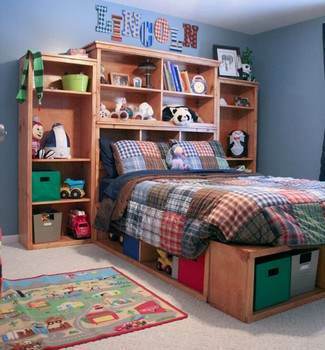 Two cubby holes for decorative baskets plus a closed storage area makes this bed the perfect fit for your child's needs. 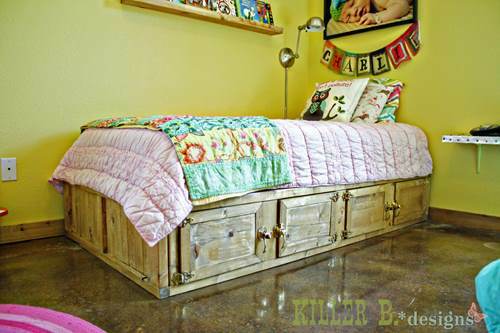 This bed has exposed bench feet and would be cute with a bench added to the foot of the bed. This plan will show you how to build a twin bed for less than what you might expect to spend and it's a cinch to make. 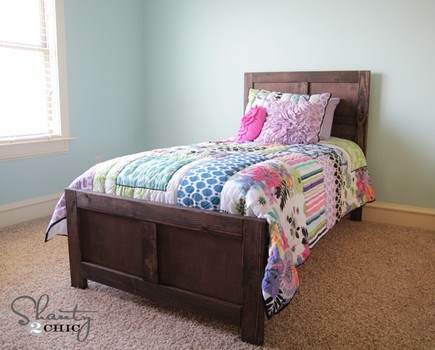 This bed was inspired by the Pottery Barn kids Emmett Bed and the lumber cost under $70. A trundle can also fit under this bed. 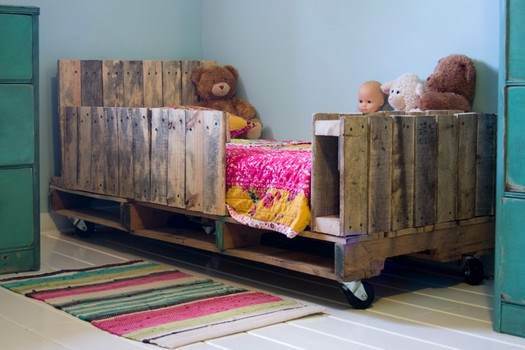 It only takes two wooden pallets, some hardware and a little of your time to make this handsome bed your child will love. This bed requires 2 or 3 pallets that are about 48 x 40. Great photos of the building process. This bed sits low to the ground making it a great fit for toddlers.This bed cost about $30 to make and was inspired by the Pottery Barn kids Fillmore Platform bed. 12 photos of how others built their beds from these plans. The bed can be made independent of the headboard.